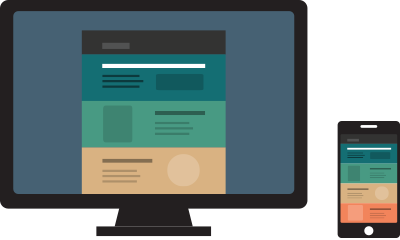 Create a clean, web-based version of any email, with desktop and mobile previews. It's perfect for sharing, and it's totally free. Using Scope is free. No signup required. 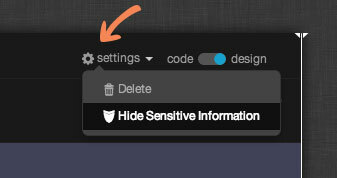 Scope It ← Drag this button to your toolbar. The Scope It Bookmarklet lets you scope an email from inside supported webmails like Gmail. Just click the button when you see an email you want to scope! 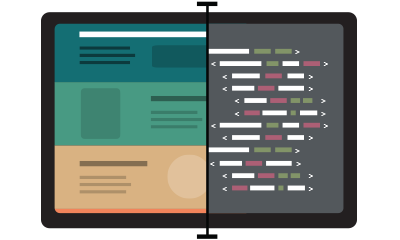 Beautifully display the desktop view alongside an actual mobile screenshot (perfect for showing off those fancy responsive design techniques you've been working on). Peek behind the curtain and see how they pulled off that cool video or fancy text. Scope's sleek code inspector makes viewing email source code a breeze. We even decode and clean up the HTML, making it crystal clear. Obscure personal information in seconds. Keep your username, email address, account numbers and other sensitive details completely private. How much does Scope cost? Nothing — it’s free! If you’d like to save your Scoped emails, you’ll just need to sign up with your email address. If my email gets Scoped, will my click or open data be affected? Links in Scoped emails are disabled, however open tracking will remain in place. Any open activity or views of the Scoped email will be attributed to the original recipient of the email. Scope is currently supported in Gmail. We’re working on adding additional webmail services, such as Yahoo! and Outlook.com. How do I obscure personal information within a Scoped email? Make sure you are signed in with your Litmus ID. After you’ve Scoped an email, you’ll see a “settings” dropdown. Click on “Hide Sensitive Information”, and you’ll see a window asking for the words, email addresses, usernames or other information you’d like to obscure. I tried dragging the bookmarklet into my browser, but it didn’t work. What’s the issue? Make sure your bookmark bar is visible and try dragging the Scope bookmarklet into that area. If you are having issues, please email us and we’ll take a look for you! Do I need a Litmus account to use Scope? No. However, Scoped emails are only available for 15 days without a Litmus ID. 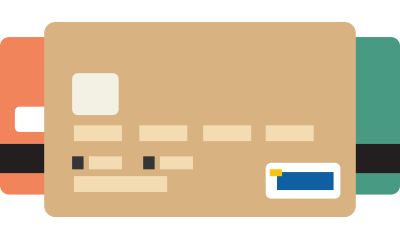 If you’d like to save your Scoped emails for longer than 15 days or have the capability to obscure personal information in your emails, you must sign up for a Litmus ID. 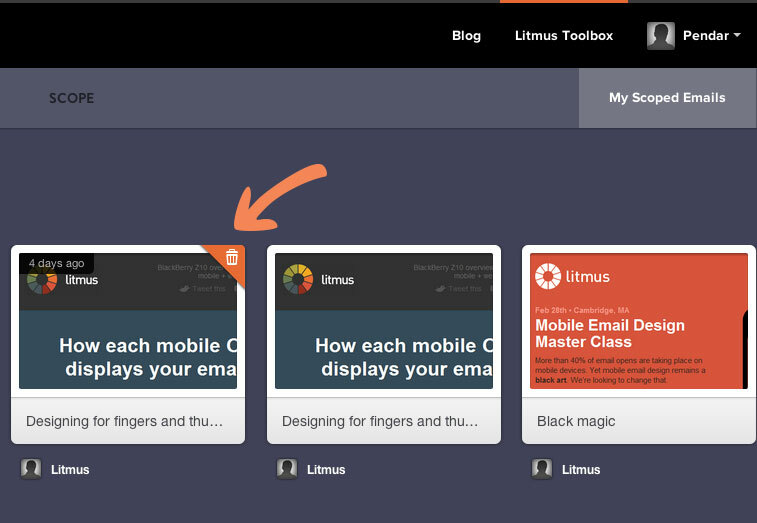 If you pay for a Litmus subscription or have in the past, you already have a Litmus ID — it’s your email address! If you need a Litmus ID, you can get one by clicking the “Save Scope” link at the top of Scoped messages, or by signing up on this page. How long is my Scope link valid? 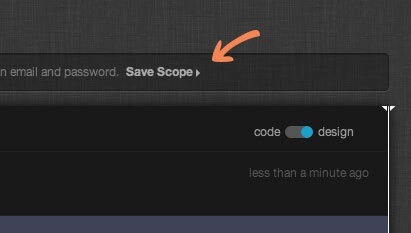 If you already have a Litmus ID and Scoped your emails while signed in, your Scope links have no expiration date. Without a Litmus ID, Scope links will expire after 15 days. Can I Scope a plain text email? Yes! You can Scope any type of email — HTML or text, personal or promotional. Does the email have to be opened to Scope it? Yes. In order to Scope an email, the email must be opened in Gmail. Once the email is opened, simply click the “Scope It” bookmarklet! How do I use Scope? Install the bookmarklet in your browser by dragging the orange "Get the Bookmarklet" button into your browser toolbar. Open an email in Gmail—it doesn't matter if images are enabled. Click the bookmarklet while the email is open. Your Scoped email link will appear momentarily! Do images in the email have to be downloaded in order to Scope it? No. As long as the email is opened, images do not have to be downloaded in order to be Scoped. Can you Scope an email from a “view in browser” link? No. Scope works within the Gmail interface, so the actual email has to be opened, not the “view in browser” link. How do I delete a Scoped link? You’ll need a Litmus ID to delete Scoped emails. After signing in, either use the “settings” dropdown on an individual Scope page, or visit your Scope dashboard to delete specific emails.